Over the past few weeks, residents of Harlem have found themselves with some unexpected neighbors. 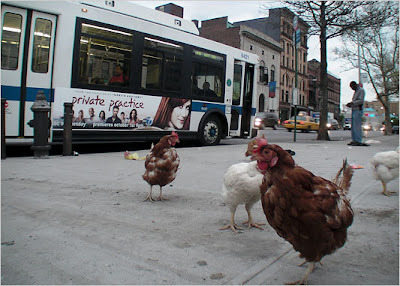 Chickens and turkeys have been spotted roaming the streets. Who's responsible? Read more here. Somewhere in the world is a freaky chicken guy. Random Irregular, Kiki's Randomness, do you know him? Is it a her? Is it YOU? Too bad they're not goats. I know a song about a harlem goat. Hazel: I don't know the freaky chicken guy, but I am CRAZY about chickens, they are so so so so so so cute and lovable!! !